Pretty from this view, wouldn’t you say? 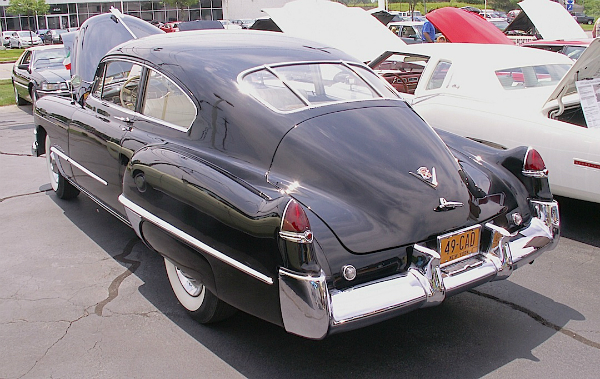 It’s a 1949 Cadillac Series 62, in the Club Coupe body style which is my favorite body style from this era. All of GM’s lines had at least one series of cars with fastback rooflines, but I think the Caddy’s tailfins really completed the look best. This black beauty was seen at this past summer’s WNY Region Cadillac & LaSalle Club car show at Keyser Cadillac in Williamsville. Jim Corbran, RRofWNY …and check out our Facebook page: Non-American Classic Cars The post RealRides Of WNY appeared first on Buffalo Cars.